Here we, again, see that Jayadvaita Swami’s editing often takes us further away from Srila Prabhupada. We see again and again that the BBT International’s claim to fame, namely that they are making the books “closer to Prabhupada” is false. In fact they are deliberately changing Srila Prabhupada’s own chosen words. In other words, they are violating the principle of arsa-prayoga – again and again. How long will this be allowed to go on? ISKCON’s unauthorized changes to Srila Prabhupada’s books are the most important issue that we, as followers of Srila Prabhupada, have to clearly understand. Our connection to Srila Prabhupada is through his transcendental books and as he says: “I am living in my books.” So if someone starts messing with Prabhupada’s books he is trying to put himself between Srila Prabhupada and us, the followers of Srila Prabhupada. No follower of Srila Prabhupada would ever tolerate such an intrusion into his relationship with Srila Prabhupada. ISKCON are trying to force devotees to only purchase books that contain thousands and thousands of unauthorized changes to and they are practically banning the reading and distribution of Srila Prabhupada’s original books. Srila Prabhupada’s mission was to write, publish and distribute his transcendental books. Prabhupada has taken the timeless knowledge of the Vedas and presented it completely without any compromise in a language and style so easy to understand. Anyone, no matter how fallen, can understand Vaisnava philosophy and become a fixed up devotee of Krishna by reading his books. Prabhupada’s books are not ordinary books. Srila Prabhupada said every night Krishna would come to him and dictate the books. Every day he would read his own books. 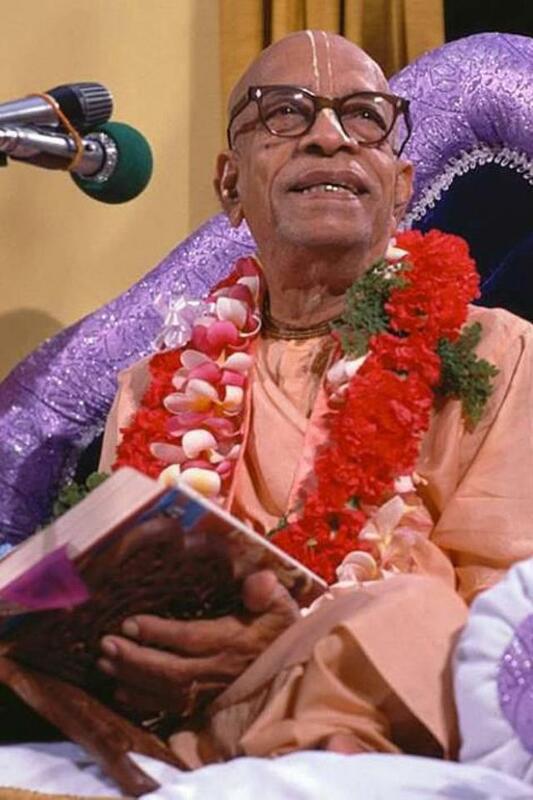 When asked by his servant, Srutakiriti Prabhu, why he was reading his own books, Prabhupada answered: “These are not my books, they are Krishna’s books.” Even Prabhupada himself was constantly reading his own books and enjoying great spiritual ecstasy. As confirmed many times by Ramesvara Prabhu [who was in charge of the BBT and the person ultimately responsible for publishing Srila Prabhupada’s books] Prabhupada’s greatest fear was that after his disappearance his disciples [who were infected with what he called “the American disease”, the tenancy to always change] would change his books and thus ruin everything. This order from Srila Prabhupada forbidding changes to his books is no secret. If you read Prabhupada’s letters you can not miss it. It is everywhere. Prabhupada is often complaining about the “American disease” of always changing and he orders his disciples not to change anything. But unfortunately as soon as Srila Prabhupada left our material vision Jayadvaita Swami started work on a new “Revised and Enlarged” edition of Srila Prabhupada’s Bhagavad-gita As It Is. 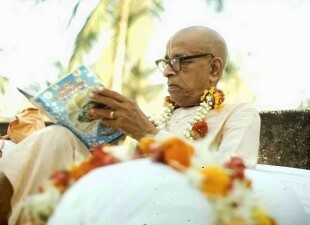 Jayadvita had been working in the BBT for years and was aware Prabhupada’s greatest fear was that his disciples would change his books after he left. Still Jayadviata had a burning desire to change Prabhupada’s books. Prabhupada’s chosen editor was Hayagriva Prabhu, however Jayadviata considered himself a better editor and thought he could do a better job than Hayagriva had done editing Srila Prabhupada’s books. So as soon as Prabhupada left the planet Jayadviata tried to go back to the earliest drafts of theBhagavad-gita, before Srila Prabhupada and Hayagriva had edited them, and he tried to remove Hayagriva’s editing style and influence on Prabhupada’s Gita and replace it with his own style and influence. Hayagriva Prabhu was a University professor in English. Eminently qualified to present Srila Prabhupada’s books in a language and style that was perfect for the Western audience. The combination of Srila Prabhupada’s writing and Hayagriva’s editing was certainly a grand success. On the other hand Jayadviata was a high-school drop-out with no qualifications in regard to the English language, however he was a very good typist. Prabhupada has said in one place that Hayagriva is the best editor and in another place that Jayadviata is the best typist. So it was like that. They were both experts in their respective fields. Jayadviata got a copy of Prabhupada’s authorized 1972 Macmillan Gita and scribbled his changes on the book. He claims his changes are based on early drafts and transcriptions of dictation tapes, before Prabhupada and Hayagriva had worked on it together extensively. But on close examination this claim turns out to be false. There is very little correlation between the so-called original manuscript and Jayadviata’s changes to Prabhupada’s Gita. Even if it was true he was trying to ‘correct’ Srila Prabhupada’s final, authorized, approved Bhagavad-gita As It Is based on first drafts that had later been corrected and edited by Srila Prabhupada himself and his chosen editor Hayagriva. It is outrageous. It is insane. No author wants his final, edited, approved and published book changed back to some early draft or dictation tape. So the “Revised and Enlarged” Gita encourages reading many books on different subject matters and applying them when necessary while Prabhupada’s Gita discourages this. And we can not find this instruction to read many book on different subject matters anywhere else in Prabhupada’s teachings. This is a new teaching, Jayadviata’s teaching, that has appeared for the first time in his “Revised and Enlarged” Bhagavad-gita. He just inserts his teachings, realizations and interpretations into Prabhupada’s books like this whenever he thinks it is appropriate to do so. I can not very extensively discuss the changes here because there are so many, unlimited, endless changes, not just in Bhagavad-gita, but in many other books. I would ask you to please go towww.BookChanges.com and make a through study of the articles there. It is amazing. BBTI gives complete freedom to their editors to change anything they want to in Prabhupada’s books. And there are no checks and balances. The editors don’t even have to keep any records of what they change. They don’t have to tell anyone what they change. BBTI put complete and absolute faith in their editors and allow them to change anything and everything in Prabhupada’s books and then they print the changed books without having the slightest idea what has been changed! This could never happen anywhere except in ISKCON. Can you imagine any organization, spiritual or otherwise, that would let one unsupervised person with no checks and balances whatsoever change whatever he wanted to change in the vital foundational documentation that forms the basis of the organization? It is insane, completely and absolutely and totally insane. This completely and totally destroys the authority of the books currently being printed by BBTI. After Dravida (another BBTI editor) reedited Srila Prabhupada’s Caitanya-caritamrta by himself with no checks and balances I asked Jayadviata if he was aware of what changes Dravida had made, his reply was “No. I do not know the specific changes, but I know the categories of the changes he made.” So BBTI printed a significantly changed edition of Sri Caitanya-caritamrta without knowing what had been changed! So “Only BBT” is absolutely out of the question. The unauthorized changed books BBTI are printing carry no authority whatsoever. Even BBTI themselves are unaware of the changes their editors are constantly making to Prabhupada’s books. So no one can know when they are reading a BBTI book if what they are reading is from Prabhupada’s original book or not. 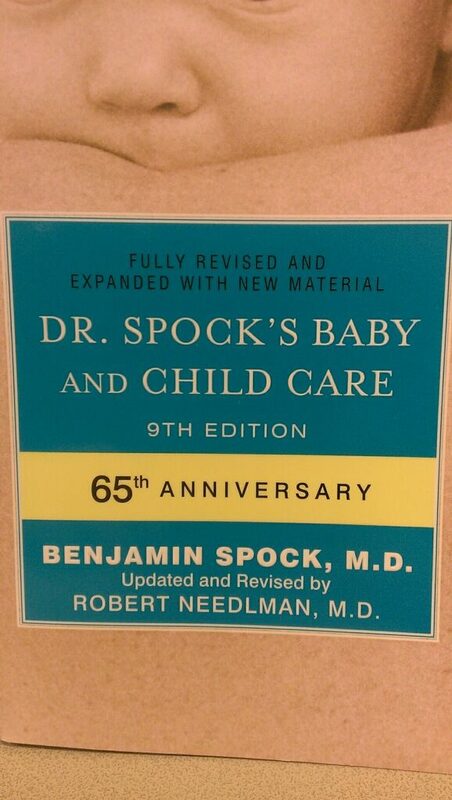 No thoughtful person will ever be interested in these unauthorized books. They have purposely implemented a revisionist mentality knowingly in defiance of Srila Prabhupada’s very clear and direct orders not to change his books. Please purchase cases of Srila Prabhupada’s original books at the wholesale prices fromwww.KrishnaStore.com and distribute them to your friends and family and to the general public. The only way we can solve this problem is by widely distributing Srila Prabhupada’s original books. So please take the responsibility for this. The prices are very reasonable and everything you pay for Prabhupada’s original books will go directly into printing more original Prabhupada books. Also please read the articles at www.BookChanges.com and educate yourself on this issue which is the most vital issue for the future of Srila Prabhupada’s movement and Krishna consciousness. To be completely honest, transparent and follow academic rules Jayadvaita Swami’s name ought to appear on the front cover of the book, so everyone – in advance – will know that this is a posthumously edited book. Of course, eventually we need to have Jayadvaita Swami’s edited version of Bhagavad-gita As It Is (and all other posthumously edited versions of Srila Prabhupada’s books) completely eliminated. But as long as the BBTI insist on violating the sastric rule of arsa-prayoga, they at least should mention it on the books. Nice to see the original and authorized Bhagavad-gita As It Is being distributed by an ISKCON swami! The man in the picture receiving the original blessed and authorized Bhagavad-gita is the Governor of the Siem Reap Province of Cambodia, the Honorable H.E. Khim Bunsong! Let us see more of this! 1. Jayadvaita Swami’s story is merely anecdotal evidence which is considered a rather unreliable and dubious support of a claim. No one is really able to investigate the truth value of his story. 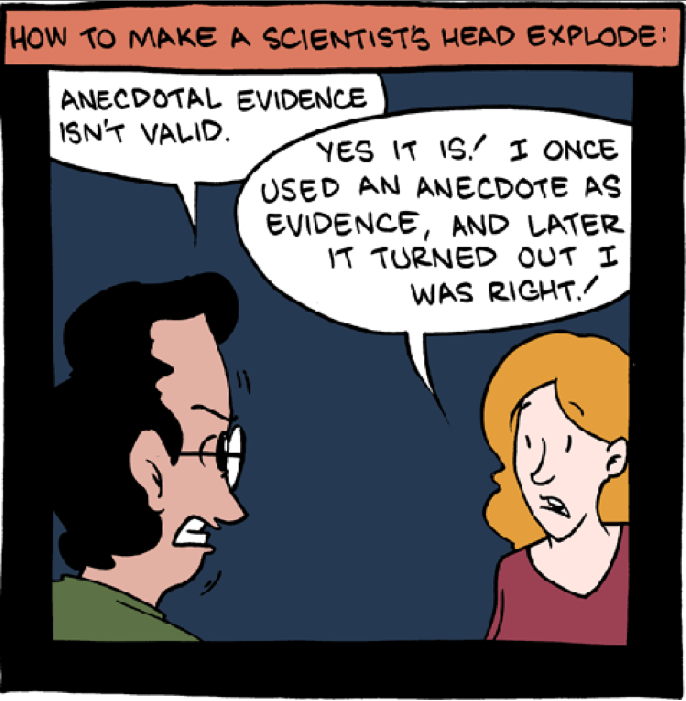 To use anecdotal evidence as the foundation for changing the books that are supposed to guide mankind the next ten thousands years will surely create doubt about the authority of the changed books. 2. Jayadvaita Swami seems to conclude that since Prabhupada approved the verses that he brought him, then he also approved that he could change all his books using the same method – even after his disappearance. But this is an unwarranted extrapolation, because Jayadvaita Swami extrapolate far beyond the range of available data, namely from one single instance of editing to more or less all future instances of editing. But from his story no justification for such an extrapolation can be found. The only conclusion to be deduced (if the anecdote is at all true) is that what Jayadvaita Swami did to the very specific verses he brought Prabhupada was okay. No more, no less. 3. If Jayadvaita Swami’s anecdote is true, then Prabhupada told him that if he had made the text closer to what Prabhupada originally said, then it was okay. Changed Prabhupada’s own personally typewritten sanskrit translations. What do we, honestly, think Prabhupada would have answered? Then try to extrapolate that answer to the changes Jayadvaita Swami has made to Prabhupada’s Bhagavad-gita As It Is. Hayagriva Prabhu was true to Srila Prabhupada’s words here. Jayadvaita Swami’s 1983 version is not! Why? And on Jayadvaita Swami’s “annotated scans” which are categorized under “See the changes” on BBTI’s website there is no annotations made to verse 4.11. Apparently not all the changes made to Srila Prabhupada’s Bhagavad-gita As It Is are to be found in this “annotated scan” that all of a sudden mysteriously re-appeared. Why do they not write that not all changes are mentioned in this “annotated scan”? Are they trying to hide some of the changes from the public? Prabhupada: So the original verse says that “All of them as they surrender unto Me, I reward accordingly. Everyone follows my path in all respects.” This means that everyone is searching after that absolute truth. Some of them are satisfied with impersonal feature. The philosophers, jnanis, they, because they want to understand the absolute truth by dint of their imperfect knowledge. Prabhupada: “All of them — as they surrender unto Me — I reward accordingly. Everyone follows My path in all respects, O son of Prtha.” God is everything, and we can associate with Him according to our choice. Prabhupada: Yes. He has not surrendered. He keeps himself separate from Krsna, and he is, artificially he shows surrender. Surrender does not mean that you reserve something for you. That is not surrender. Surrender means without reservation. That is surrender. Everyone is seeking to find out Krsna. Directly or indirectly. Krsna means the all-attractive. All-attractive. Bhagavan means the all-attractive Supreme Personality of Godhead. So indirectly or directly, everyone is seeking Krsna, the all-attractive. Ananda-mayo ‘bhyasat. The Supreme Bliss. We are continuing from yesterday’s subject matter, how one can become purified and go back to home, back to Godhead. Prabhupada: This is page one-hundred-eighteen, yes. Prabhupada: It [the microphone] is not fixed up right. Prabhupada: God realization, there are three aspects: brahmeti paramatmeti bhagavan iti sabdyate [SB 1.2.11]. Again we see that Jayadvaita Swami’s and BBT International’s claim to fame – namely that they are making the books “closer to Prabhupada” – is false propaganda. Many, many changes – hundreds (if not thousands) – are further away from the words that Srila Prabhupada originally wrote or dictated. Their claim about not making needless changes is proved false by the changes to Bg. 4.11, since this change is not at all needed. Does Jayadvaita Swami and the BBTI trustees ever ask themselves this question: If making all of these changes is our way of surrendering to Srila Prabhupada, then what will our reward be? 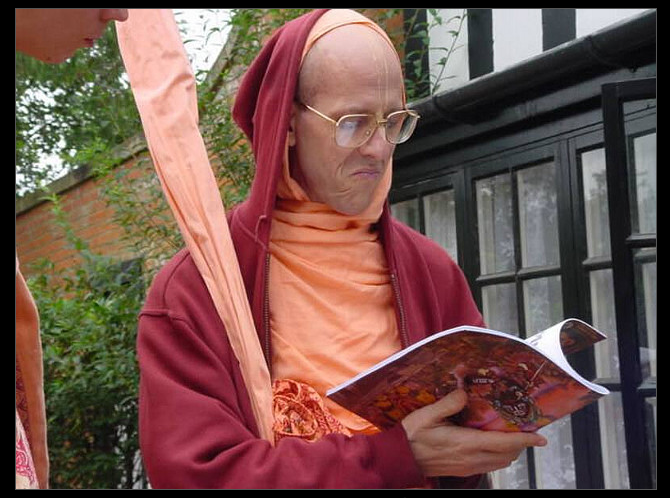 Recently, the ambitious corporate climber, Tamohara dasa/GBC Chairman, posted on ISKCON cheerleading­­­ website a deceptive letter addressing the devotees and the temples, where they should purchase their books. He is attempting to self-righteously clamp down on distribution of the ORIGINAL Srila Prabhupada’s Bhagavad-gita on the pretext that it is not authorized by Srila Prabhuapada’s created BBT. The purpose of ‘his’ letter is based on their (GBC) need for continuation of intentional ‘dumbing down’ of naïve devotees that is unfortunately based on complete lie and deception that most of rank and file devotees are not aware of. GBC/BBTI wants to completely control and systematically undermine Srila Prabhupada created ISKCON, BBT and his real teachings which are based on pure devoti­­­­­onal principles. 1) Firstly, after Srila Prabhupada’s departure they fraudulently and secretly incorporated their own private BBT called BBT INTERNATIONAL, that illegally replaced Srila Prabhupada’s BBT in their attempt to usurp total control and to put a stop to distribution of original Srila Prabhupada’s books. Replacing them with their own revised editions that was mentally contrived by Jayadvaita swami. For example why is there any need for a “Corporation” to assist the BBT in its service? Why does this ‘authorized agent’ for Śrīla Prabhupāda’s BBT now have the ‘copyrights’ for Śrīla Prabhupāda’s books? What or who stopped the BBT from printing his Śrīla Prabhupāda’s books in their original unedited format as a natural process after Śrīla Prabhupāda entered into Samādhi? Is there any authorization from Srila Prabhupada stipulating that his books should be edited after his entrance into Samādhi? And if there is no authorization for editing or printing Śrīla Prabhupāda’s books, why are they doing it, especially after it is creating so much controversy amongst Śrīla Prabhupāda direct disciples? Following is what the BBT International say is the relationship between the BBT and BBTi. The Bhaktivedanta Book Trust (BBT) is a California religious trust that owns the copyrights to the works published by His Divine Grace A.C. Bhaktivedanta Swami Prabhupada during his lifetime. The Bhaktivedanta Book Trust International (BBTI) is a California corporation that has acted as an authorized agent of the Bhaktivedanta Book Trust since 1988. The BBTI also owns the rights to some later works. The BBT and BBTI work together to protect Srila Prabhupada’s rights and serve his will. The important aspect of this subterfuge is that no one really knows what is going on… First they say that Śrīla Prabhupāda ‘owns’ the copyright of his book as per the BBT documentation but and it is a big but, what is this document where it shows the BBTi have the copyright of Śrīla Prabhupāda’s Bhagavad Gītā As It Is??? What Bhagavad Gītā are they copyrighting? Is this their way of replacing Śrīla Prabhupāda’s Gītā with their own edited version so it can be edited ad infinitum all the while leaving Śrīla Prabhupāda’s Gītā gathering dust archived somewhere? This also begs the question how many of Śrīla Prabhupāda’s books have they done away with him as the author and placed the BBT as the author, leading the unsuspecting devotees to believe that they are reading and distributing Śrīla Prabhupāda’s books but in actual fact these are reading and distributing phony books. I would not be surprised if in the future they openly say that these are not Śrīla Prabhupāda’s books at all, bearing in mind they ‘legally’ state that these books are ‘authored’ by the Bhaktivedanta Book Trust. The general devotees are so dumbed down to accept anything that the BBTi does or say as gospel truth or should we say ‘emet’ truth. 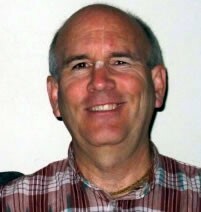 Consequently, once Śrīla Prabhupāda’s ‘as it is’ stance based on the ‘absolute truth” is undermined by the subjective truths of individuals such as Jaya Advaita Swami, then his books become ‘open game’ for any future BBT corporation/board and corporate members to edit according to their own interpretations of the truth that are fashionable at the particular time, place and circumstances. Devotees such as Ravindra Swarup, Tamala Kṛṣṇa Goswami, Kṛishna Kestra and Hridayananda etc, being heavily influenced and attached to secular academics have basically turned Śrīla Prabhupāda’s ‘as it is’ principles which are based on the understanding that truth is ‘absolute’, into truth being more in the realm of relativistic truth or truth that is malleable according to one’s personal cultural/psycho-physical background/realization/desire/preference. 2) Secondly, over the years they conjured a plethora of false rhetoric’s to justify and rationalize their big deceptive lie. However any individual, who takes the time to study the issue, will soon recognize that all their feeble excuses are based on bluffing and cheating and nothing else. a) We are re-writing Srila Prabhupada’s books to appease Academia so we will be recipients of approval by them with a pat on the back whilst telling us “good ‘little’ boys”. b) We are re-writing the books to make it “closer” to Srila Prabhupada`s drafted version. Unfortunately, everything that they rationalized and justified up till now is one BIG FAT, and SMELLY LIE. I urge the readers, who are not sufficiently educated with this important matter to visit the https://arsaprayoga.wordpress.com/ to see and analyze the comprehensive evidence that completely exposes them and indentifies them for what they really are. Since the latest groundswell of the devotees questioning and clearly exposing this BIG fraud, Jayadvaita swami is out of fear resorting to a wicked non-vaisnava behavior in order to bamboozle the naïve devotees and perhaps himself, into believing his deception. Some time back he wrote an article “Book Changes: History Backs the BBT” lying thru his teeth in the attempt to bamboozle devotees that Hayagriva prabhu never worked together with Srila Prabhupada on Bhagavat-gita. Sadly, for him it back fired on Jayadvaita Swami, when his article was completely and chronologically refuted by Madhudvisa prabhu in article titled Jayadvaita’s Smoke and Mirrors which was a response to what appears to be a planned, conscious and intentional lie on the side of Jayadvaita swami in hope to completely erase Hayagriva pr, from the pages of ISKCON ‘real’ history, and replacing it with his own deconstructed history. Due to the BBT’s standing on perpetual editing of Śrīla Prabhupāda’s books it has forced devotees who want to see Śrīla Prabhupāda’s original books to be printed and distributed (which is after all the stated purpose of Śrīla Prabhupāda’s BBT) they have resorted to printing his books themselves – for example KBI and in particular Jitarati Prabhu’s printing of the ‘Pocket sized Bhagavad Gītā ’ which by the way was a huge success selling out nearly all 100,000 books that they printed! You have to pause and think about this for one moment… One Hundred Thousand (100,000) of Śrīla Prabhupāda’s original unedited books! Now this only goes to show that people want his unedited books! Their success has so infuriated Jayadvaita swami that in his rage he began calling these books ‘rittvik’ books! Not only did he label them rittvik books he also began actively preaching to devotees not to purchase read or distribute these ‘rittvik’ books! How pathetic is that? He is trying to say that Srila Prabhupada did not write the original books, but the evil RITTVIK`s DID IT!!!!!! ….HELP HELP HELP…save us from rittviks…and their evil “Original Srila Prabhupada” books. Come on Jayadyaita swami, how low can you go? Naturally, when Jayadvaita swami was asked did Srila Prabhupada give him or anyone for that matter any instruction/consent to re-write his book “ad infinitum” after his departure, his answer is NO. Yet he disobediently continues with his offence to our glorious spiritual master. WHICH MAKES ME WONDER WHO IS HE WORKING FOR, SINCE HIS ACTIONS CLEARLY AFFIRM THAT SRILA PRABHUPADA IS NOT HIS AUTHORITY AT ALL? This is a very important point to consider especially when he would be loved rather than hated by many of his godbrothers if he spent his time and efforts to publish Śrīla Prabhupāda’s original books instead of putting our whole Vaiṣṇava society in such a hurtful and disheartening dilemma by spending not only countless hours scouring Śrīla Prabhupāda’s works to find what he perceives as an error or fault in the works of the uttama adhikāra devotee of Lord, editing those works and then publishing what he believes is the more superior/authoritive work. While we are at it and going on the principle of establishing ‘shadow’ bodies to supersede the bodies that Śrīla Prabhupāda established, I would like to ask the GBC mouthpiece Tamohara dasa, why did they secretly and systematically privatize Srila Prabhupada’s created ISKCON, transferring the control into illegally created ‘shadow’, such as GBC of West Bengal, BBT International corporation etc, that have they own laws and by-laws and are diametrically opposed to the ones created by Srila Prabhupada. Huh, mister mouthpiece, please tell us??? However, I know that we will not hear from Tamohara nor any other GBC and BBTI corporate members (cronies), about this secret hijacking of Srila Prabhupada`s ISKCON, and its replacement with this Fraudulent ISKCON. CALLED FISKCON. We know that you want to keep this secret, because you know if the rank and file devotees wake up to how devious your agenda really is, they will have a revolution and unceremoniously kick you all out onto the curb. Nevertheless, with time the devotees are waking up, just like is with the case of devious book changes of yours and are becoming more and more educated and enlightened with your secret plans, hence the time will come for you where you will not be able to bamboozle innocent no more and your ivory towers will come crumbling down like a deck of cards, with you in it. The main question devotees must be asking is – why are the BBT trustees relentlessly and ruthlessly pursuing this course of action? If all their efforts were placed on the printing of Śrīla Prabhupāda’s original books and making sure the Temples were distributing his books we would not be involved in such terrible controversies for all these years, wasting so much time resources and money that the BBT could use to print more books.